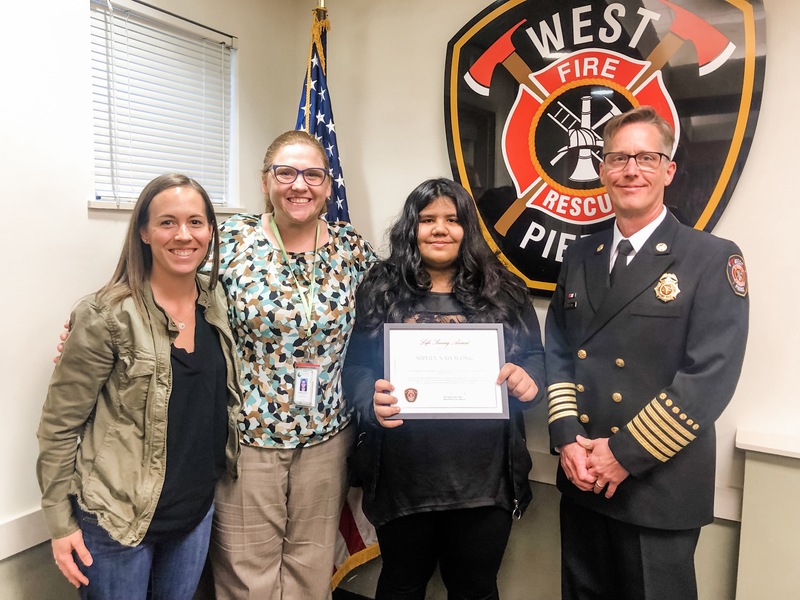 At Tuesday night’s Board of Fire Commissioners meeting, West Pierce Fire & Rescue had the pleasure to recognize Sophia, a student within the Clover Park School District for her bravery and quick action when her younger brother started choking. Shortly before this incident happened, Sophia’s class was visited by West Pierce public educators who teach fire and life safety topics to students in Kindergarten through 5th grade. As her brother started choking, Sophia jumped into action and used the skills she learned during the presentation to clear his airway and ultimately save his life. Sophia received a Life Saving award for her heroic efforts and was given a Chief’s coin by Chief Sharp, a coveted symbol of the fire service. West Pierce Fire & Rescue is proud to recognize those in the community for such brave and heroic acts and want to congratulate Sophia on a job well done. In 2018, West Pierce Fire & Rescue’s public educators taught fire and life safety lessons to more than 8,000 students within the Clover Park and University Place School Districts. Their efforts include topics but are not limited to, fire safety, CPR, first aid, booster seat and water safety. To read more about the school programs in place, please see the 2018 Annual Report. Pictured here is (left to right) school counselor Jessica Jorgenson, Principal Megan Qualls, Sophia and Chief Sharp.